The following group types are not accepted by this hostel: Holiday with Friends, Junior / Primary School, High / Secondary School, Business Trip, Stag/Hen/Bachelor Party, Sports Group, Cultural Group If you have misrepresented the type of group you are booking for, your booking may be cancelled by the hostel." Here you have many attractions starting with Lion Rock were you can see the old fortress and have a nice view of all the area. There's also Pidurangala Rock were you can see the sunrise and have a great view of Lion's rock. Pollination Ruins are one hour away by local bus or tuk tuk. In Dambulla you can go to the beautiful Golden Temple were you can see hundreds of Buddha's statues. We also organize safaris to see big groups of elephants. 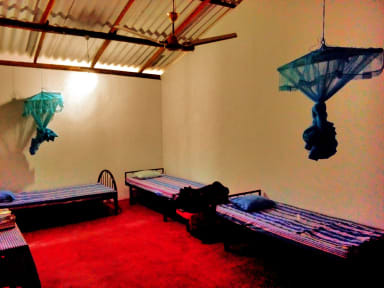 We have a tree house and 10 bed with mix doorm also 6 6bed female comfortable doorm, all equipped with mosquito nets and a big ceiling fan. The property is clean and has relaxed atmosphere. Additionally you can rent our beautiful treehouse, which is a double room with a double bed with a mosquito net. And yes, it's really allocated on a tree.